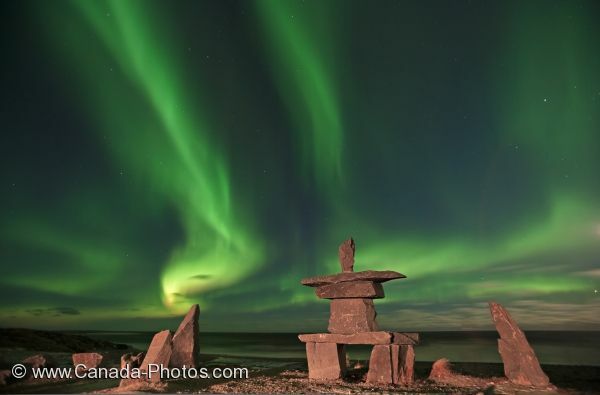 The bright green lights of the Aurora borealis seem to be creating spiritual dances above the Inukshuk along the coastline in the town of Churchill, Manitoba. The sky is flooded with these magical Northern Lights which makes the presence of the stars much brighter as well. Northern Lights, Aurora borealis, above an inukshuk in the town of Churchill, Hudson Bay, Manitoba, Canada. Picture of the Northern Lights creating a magical aura above an Inukshuk along the Hudson Bay in Churchill, Manitoba.